I need to be careful, because I think I’m slowly becoming a handbag hoarder. I used to be a one-purse kinda girl, wearing one versatile style with basically everything and for any occasion. But as time goes on, I’m starting to appreciate having different bags in my wardrobe to switch into. As much as my closet protests, there are definitely more purses in my future this year. In fact, I’ve been a bit crazy browsing purses on Amazon lately. I just got a crossbody bag from my Amazon wishlist for the holidays, and I was surprised with how much I love it. There are actually a ton of cute purse options on the site at super low prices. 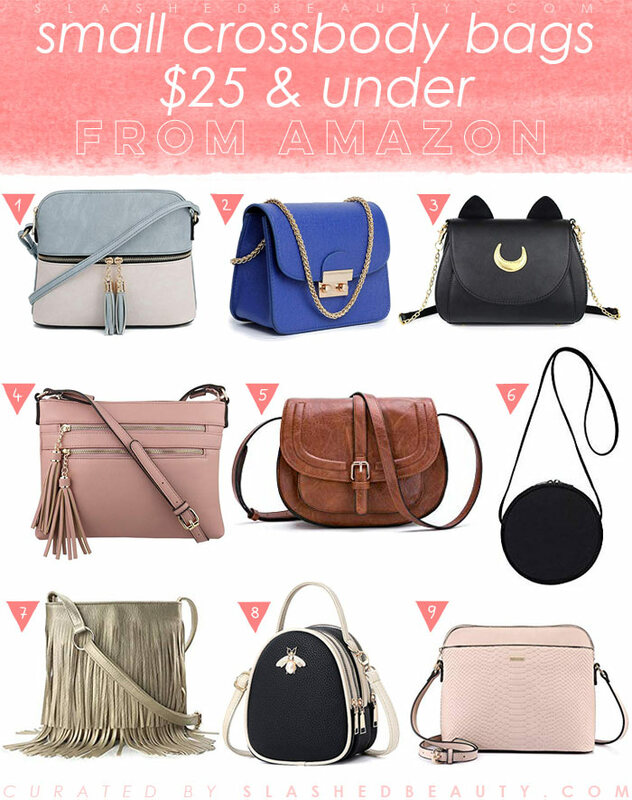 As part of my own browsing and wishlist making, but also to share with you all, I curated a list of what I believe to be the cutest small crossbody bags from Amazon at just $25 and under! Click on the picture of the bag to find it on Amazon. This bag is made of vegan leather, with two outer zipper pockets, and storage pockets inside the main compartment for organizing. It’s a lightweight bag that isn’t bulky, but definitely has room for all your daily must-haves. If you’re looking for something that can go from day to night, this crossbody is perfect for dressing up or down. It has one main compartment with a slip compartment, and a chain strap that can be adjusted to wear higher or lower. The gold accents and structure of the bag make it look expensive, but it won’t even set you back twenty bucks! For something a little more whimsical, This cute bag has a moon motif and small ears to resemble a kitty cat. Reminds you a little bit of Sailor Moon, right? It has an outer slip pocket and roomy main compartment within the snap fold-over closure. There’s also an inner zipper pocket for keys or other small items. With so many pocket compartments, this is a great daily carry for keeping everything with you. This bag accommodates bulkier wallets and glasses cases, and comes in a bunch of different colors to match your personality! I personally love the saddle bag style, and this is one of the most popular on Amazon! You can actually get this one in a variety of colors but also sizes— small and large depending on your essentials. I like the classic brown color for a style that will match many casual outfits. A round purse is a fun shape that’s a little out of the norm. This round crossbody, which can also be used as a clutch, has one outer slip pocket and main compartment enough for about as much as you can fit in a typical clutch: card carrier, keys, a bit of makeup, etc. Here’s a little something sassy that will add great movement to your loo. This vegan leather fringe purse definitely makes a statement. I love the gold color for a splash of flash. Note that the strap is not adjustable on this bag. The bee/beetle motif is getting super popular on purses thanks to Gucci, so some might say this is heavily inspired by the high-end brand. This bag is unique in that it has three main compartments with a vertical zip similar to a backpack. If you like the look of crocodile pattern but want to be more eco-friendly, this synthetic leather style sip erfect for you! One side has the crocodile skin pattern with a slip pocket, while the other is smooth with a zip pocket. The main compartment has two slip pockets, another zip pocket, and can hold even an iPad mini! Do you stick to one handbag or a few different styles? Previous articleDoes Hyaluronic Acid Work in Dry Climates?